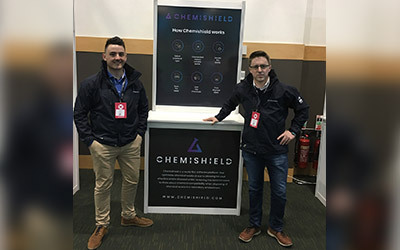 A journey borne out of a laboratory-based incident over 7 years ago took another giant leap forward last week as Chemishield was introduced to the Irish and International technology community at Dublin Tech Summit. Joining a host of leading companies and fast emerging start-ups this two-day whirl wind event was as much an education as an eye opener to the global opportunity that is ahead with Chemishield. Dropping by our stand included a host of interested techies, international speakers, crowd funders, angel investors and trail blazing entrepreneurs, this was exactly what the Doctor ordered as we pitched our game changing innovation, fielded questions and importantly learnt how others are navigating the fast changing and accelerated global market place. We also attended some thought provoking talks and seminars, knowledge = power! When we signed up for DTS we sat down as a team and thought ok, what are we looking to achieve here? If truth is to be known, our expectations were yes, this would be a fantastic event, good for profile and marketing opportunity, a test bed for the road ahead, indeed a pitch competition to sharpen our elevator and some learning along the way, but such expectations were blown through the roof of the Convention Centre as we unexpectedly (perhaps naively in our view of the world) were approached by a fine gentleman, leading out technological innovation for a global pharma company and within a few minutes of engagement he asked if we would present our innovation to them at an event later this month that will be attended by global leadership. So, what does this mean for Chemishield? A front and centre opportunity to showcase and engage with our target audience in their own back yard as to how our software (world first) can make this life changing pharma companies global lab footprint safer, compliant, efficient and cost effective. So, if I am to take one piece of learning away from my two days at the fantastic DTS it is to never judge a book by its cover.